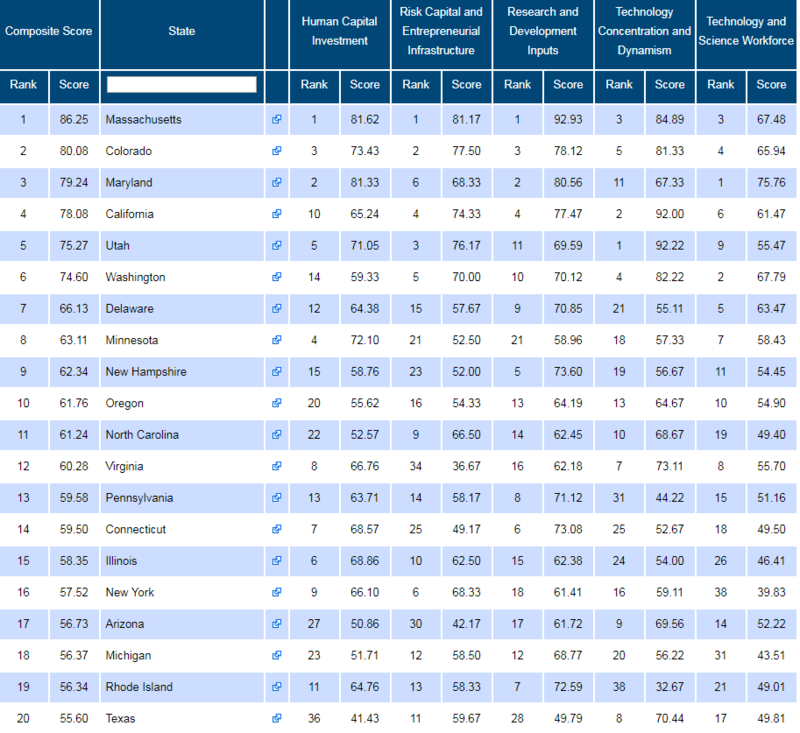 Massachusetts boasts the nation’s best business environment for science and technology, according to the 2018 State Technology and Science Index (STSI) recently published by The Milken Institute, a publicly supported, nonpartisan, independent think tank based in California. The Milken Institute issues the STSI every two years and Massachusetts has been in the top position since 2002. This category studies a state’s R&D capacity to determine if it has facilities that can attract funding and create innovations that can be commercialized. Massachusetts has been the leader in this category since the inception of the ranking and it looks like this trend will continue in the future. The combination of top universities and related investment from the private sector has contributed to the state’s success. This subset of indicators measures the environment for entrepreneurial success and venture capital activity such as patenting activity, business formations, and initial public offerings. In 2018, Massachusetts regained the No. 1 spot from California thanks to its diverse high-tech sector which attracted a large concentration of funding sources. The Bay State is also far ahead of every other state when it comes to the rate of biotech VC funds ($195.97 per $100,000 of GSP). Massachusetts operates two venture funds, a standard VC fund and a clean energy one. The Milken Institute qualifies human capital as the most important intangible asset of a regional or state economy. When it comes to this category, they look at indicators that suggest the skill levels of the current and future workforce (number of bachelor’s, master’s, and doctorate degrees based on the state’s population) and measures specific to STEM degrees. Investment in human capital is essential to the competitiveness of regional economies. Local universities, community colleges, and accredited technical and vocational training facilities develop students’ skills and make a vital contribution to the rising quality of the workforce. Higher education, especially in STEM fields, creates a workforce more adaptable to change and enhances the ability to innovate. It also increases a region’s appeal to potential employers, promising a steady flow of skilled local graduates. The number of top universities in Massachusetts helps to provide a high rate of science and engineering graduates that help fuel the state’s top notch performance in these areas. Recently, Massachusetts topped WalletHub ranking of the most educated states in America. In addition, Boston has the highest educational attainment percentage in the country: 45% of its residents have Bachelor’s degrees versus 33% nationwide and 25% hold Master’s degrees compared to the U.S. average of 12%. The intensity of the technology and science workforce is defined by the availability of high-caliber technical talent. Intensity is calculated from the share of employment in a particular field relative to total state employment. The Institute looks at almost 50 occupation categories in three main areas of employment: computer and information sciences, life and physical sciences, and engineering. By measuring technology growth, the Institute is able to measure how effective policymakers and other stakeholders have been at transforming regional assets into regional prosperity. Infrastructure, tax and regulatory policies, quality of life, proximity to market, and many other components of regional competitiveness contribute to a state’s ability to transform small entrepreneurial firms into large anchor companies. As “The Hub” of Massachusetts, Boston is leading the way in Science and Technology, and is a desired destination for a growing number of meetings and conventions with a focus on science and high tech. In 2018, we hosted 54 high tech and 40 medical/health care events at the BCEC and the Hynes and many of them achieved record-breaking attendance. Explore Why Boston (and Massachusetts!) is a great destination to bring your next event!